We like to consider business from our customer’s perspective. And what do customers want from a service provider? Honest practices, reliable products and informative employees who are more interested in a customer’s needs than in meeting a sales quota. Our belief is that providing customers what we would want from a company will keep us in business, and it hasn’t let us down yet. SODECO has been serving Albuquerque for over 35 years. A customer shouldn’t feel pressured into something they don’t need, but a lot of companies will use fast-paced interactions and confusing language to make people feel like they have to have a product. This leaves unsatisfied customers who have a product they now don’t know what to do with. And if they’ve bought an item that needs to be installed, they have to take the extra step to find someone for that. We believe customers deserve the kind of honest service that we’d want to receive. And that’s why we offer it. We’re comfortable if customers ask around and fact-check to ensure they’re getting what they need. 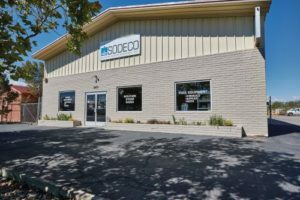 Originally founded in 1979, SODECO has been providing bathtubs, pool supplies, home water treatment and water softeners for over three decades. Not every home needs a water softener; we’re not going to try to talk you into something that you can’t afford. What we will do is offer you complete service. We sell the products, we install them and we offer long-term maintenance and parts support. You won’t have to buy a new water softener if it’s only halfway through an average lifespan; we’ll come and repair it to ensure that you get your money’s worth out of it. We’ll even teach you how to maintain it so you save money with safe DIY maintenance. Contact us today! We’re always willing to answer questions and help you make the decision that’s best for you and your household. Find out more! Call 505.883.5061 today! Site Map Sodeco Modern Water Systems, Inc. Copyright Sodeco Modern Water Systems, Inc.